As We Think was originally titled As A Man Thinketh. 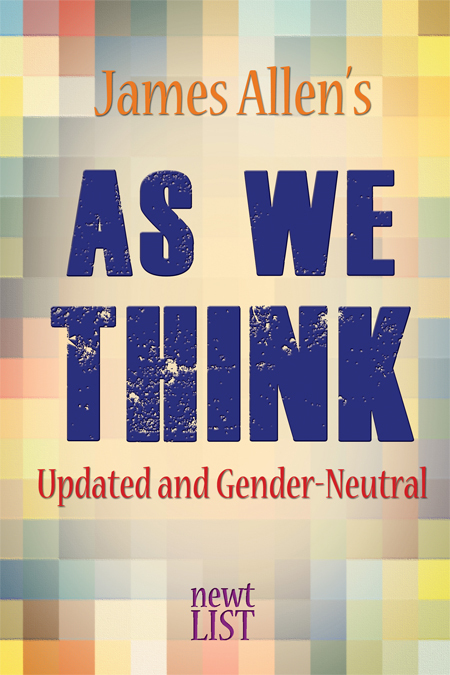 Newt List now offers James Allen’s classic book with all gender-neutral and updated language. This little volume—the result of meditation and experience—is not intended as an exhaustive treatise on the much-written about subject of the power of thought. It is suggestive rather than explanatory. Its purpose is to stimulate you to the discovery that you are the maker of yourself by virtue of the thoughts you choose; that mind is the master weaver, both of the inner garment of character and the outer garment of circumstance; and that, as you may have previously woven in ignorance and pain, you may now weave in enlightenment and happiness. As We Think is self-help pioneer James Allen’s most successful book and continues to be read by students of spiritual philosophy worldwide.